Still waiting for a call back from our local referee. Also, the power steering pump decided to poop the bed. I test drove it for about 5 miles and when I got home the reservoir was overflowing and bubbling while it was running. Let it sit over night and now the brand new fluid is kinda foggy red with little metal flakes in it. I finally got a call back from the Alemeda college referee today. According to him I am good to go. He said the engine family located in the door jamb of the donor truck had to be VCK11LCRMDK and under the hood TTY3.42JG1GK. It does not matter if the ECU is for a 2wd, just as long as it is for a manual transmission. 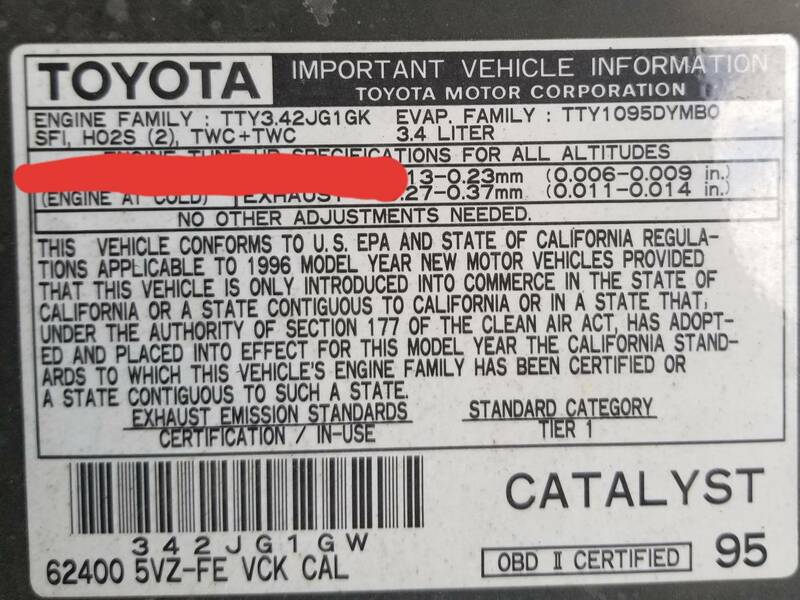 As for the ECU check I would be good to go to get a printout from the Toyota parts department showing it is the matching ECU for the donor truck VIN. According to him these ECUs aren't really programmable and the will be checking that during the inspection. suggested to do what I guess is a smog pre-test to check all the emissions monitors since I dont have the capability myself. However, he said my intake would be up to the shop supervisor's discretion if not having the heat shield on the intake is acceptable or not. Lastly, the exhaust crossover is still allowed. Fingers crossed I'm going to send it and hope for the best.